The Golden State Warriors stamped their claim on a dynasty. 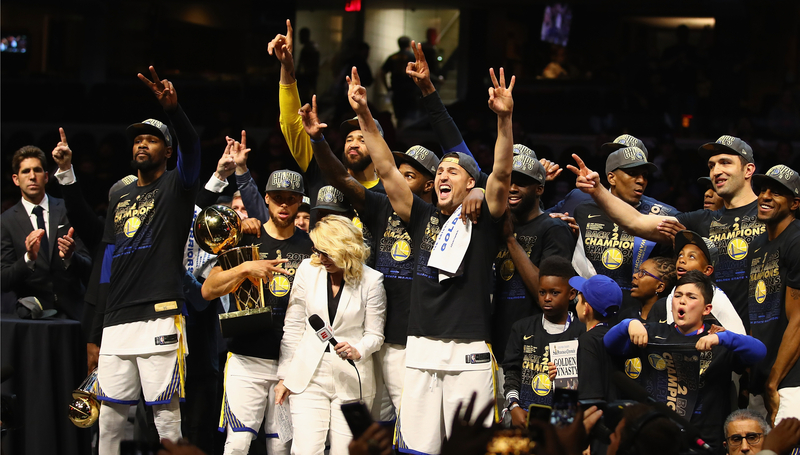 The Golden State Warriors just completed the best four-year stretch in modern NBA history, and yet their greatest achievement during the run hasn’t been their dominance, but rather what their invincibility has inspired. In the aftermath of the Warriors winning their third title in four years with a sweep of the Cleveland Cavaliers in the NBA Finals, there has naturally been a need to contextualise Golden State’s place in history. They are, of course, a dynasty now, having joined only three other franchises – the Boston Celtics, Los Angeles Lakers and Chicago Bulls – with three championships over a four-year span. Their record of 328-83 (.798) in the regular season and playoffs during that stretch is the best four-year winning percentage in NBA history, beating out Magic Johnson’s 1985-88 Lakers (.754) and Michael Jordan’s 1995-98 Bulls (.758). The only season over the past four years that didn’t end in Golden State lifting the Larry O’Brien trophy was one in which they set a record with 73 regular-season wins. The Warriors are historically great and everyone recognises that. But for as many conversations that are going on today about how great this team is, there are just as many, if not more, centred on how they’ve ruined basketball. Think about that for a second. We’ve just witnessed a team reach the very peak of the sport – not just in terms of overcoming 29 other challengers to win the title, but in how flawless they were to get here. Their collection of shooting, talent, unselfish personalities and playing styles melded into something we’ve never seen before and the result feels like someone solving a problem and all of its variables. We’re in awe of that, sure. But we’re also upset and dismayed a team can have everything figured out and, frankly, be this good. At the end of the day, sports are a vehicle for entertainment and we want to be entertained. Greatness can be entertaining – how many people have you ever heard say Jordan ruined basketball? – but these Warriors feel inevitable and infallible in a way we’re not used to. They have us questioning rudimentary concepts like competitive balance and fairness, while making the NBA season feel like a formality, even if the end result was in doubt along the way. Golden State’s players and coaches seemed more relieved than anything after completing their task on Friday. There was unbridled jubilation after they won it all in 2015 and a feeling of ‘mission accomplished’ after their triumph last year. This time, however, it felt like an unburdening. That may sound arrogant, but that’s exactly the overwhelming sentiment the Warriors inspire. They’re supposed to win and they’re supposed to do it in a way which makes you feel helpless. Golden State have cracked, if not completely broken our psyche. We’re annoyed by how easy they make it look. Which is why after the Finals ended, the focus immediately turned to LeBron James‘ future. That’s expected considering he’s the best player in the world and the face of the NBA, but part of the reason we’re so invested in what LeBron decides to do this summer is because we’re desperate for someone to end the Warriors’ reign. And if James can’t do it with a handpicked situation, who can? Well, the Houston Rockets nearly did in the Western Conference Finals. They were one win away from eliminating Golden State and up double digits in Game 6 and 7, only to falter. The Celtics appear to be the best challenger in East going forward after reaching the doorstep of the Finals without Kyrie Irving and Gordon Hayward. This may be the last time we have this loathing attitude towards the Warriors for how hopeless they’ve made us all feel, although it’s not out of the question this keeps going for another few years, especially if Golden State want it to. For now though, if you don’t want to celebrate this team for what they’ve achieved because it feels unjust or unfair, then at least recognise they can make you feel that way despite doing it all within the confines of the rules. The Warriors haven’t’ just beaten the rest of the NBA, they’ve defied our construct of competition. Kevin Durant was named the NBA Finals MVP for the second year running. 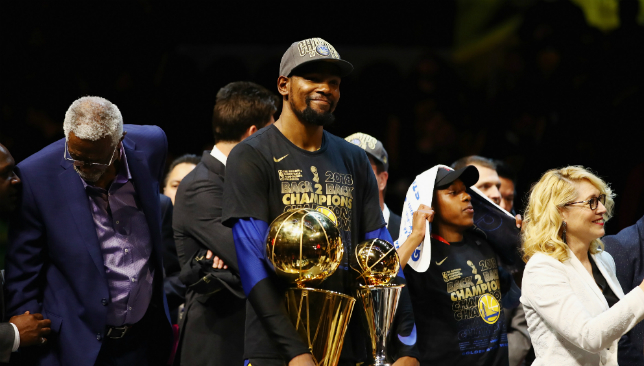 Kevin Durant hailed his inspirational team-mates as his Golden State Warriors team secured back-to-back NBA titles and he joined an exclusive club. 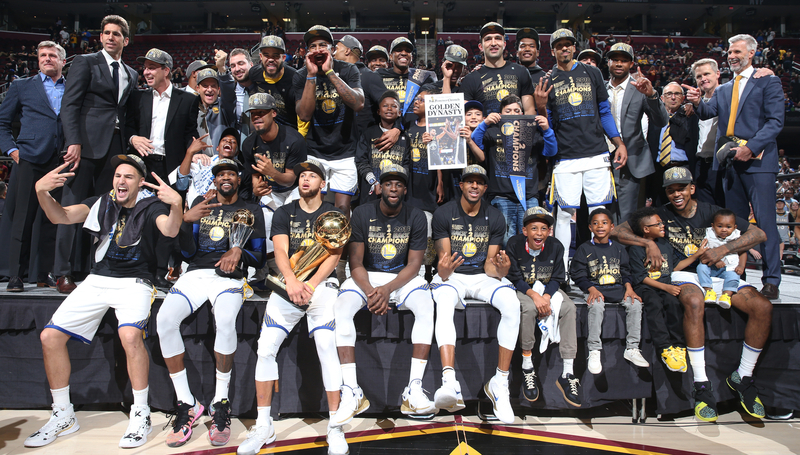 The Warriors swept the Cleveland Cavaliers in the best-of-seven finals series, winning the fourth match in Ohio 108-85 on Friday to secure their third championship in four years. Durant was chosen as the series’ Most Valuable Player, and became only the fifth player in history to register a 20-point triple-double in a title-clinching game. Warriors guard Steph Curry contributed 37 points to the winning cause, as LeBron James and the Cavaliers lost out to the Oakland franchise for the second successive year. Durant said: “This is about the journey – all season, getting up, going to work with these guys is amazing. “The environment is incredible. It’s good for you to be around guys like this, it helps you become a better basketball player and a better man. Asked about the contest with Cavaliers superstar James, Durant added: “When you play against one of the best, it brings out the best in you as well. James revealed he had played the final three matches of the series with a broken hand, a “self-inflicted” injury, reportedly sustained when he punched a whiteboard after the overtime defeat in game one. Warriors head coach Steve Kerr admitted the talent in his team made this success easier to take in than previous successes. “It was definitely the toughest from the standpoint that it was the fourth year in a row that we’ve attempted to get back to the finals,” he told reporters at a post-match press conference. “I remember sitting in this room three years ago and this feels more like reality. I hope that doesn’t sound arrogant. That’s just the talent we have, the experience we’ve gained. After building a nine-point lead by half-time, the Warriors put the game out of Cleveland’s grasp with a third-quarter rally in which they outscored their opposition 25-13. LeBron James left the court with 4:03 left on the clock and the Cavs down 102-77, having just turned over the ball to Durant while the game slipped out of their reach. James had 23 points on the night, with his Cleveland side looking to do the improbable and overturn a 3-0 deficit for the first time in NBA Finals history.